History is often told by the winners. I remember learning about World War II, and my home country's atrocity in the mass incarceration of well over 110,000 Japanese-Americans across America was only glossed over. This week is the 30th anniversary of the start of the Tiananmen Square protests in Beijing, wherein an estimated 10,000 civilians were slaughtered on June 4 by troops sent by the Chinese government. Today, it remains one of the most censored events in Chinese history. It's circumstances like that, in nationalistic-minded negligence, that makes trusting the history we learn from people and books so hard. 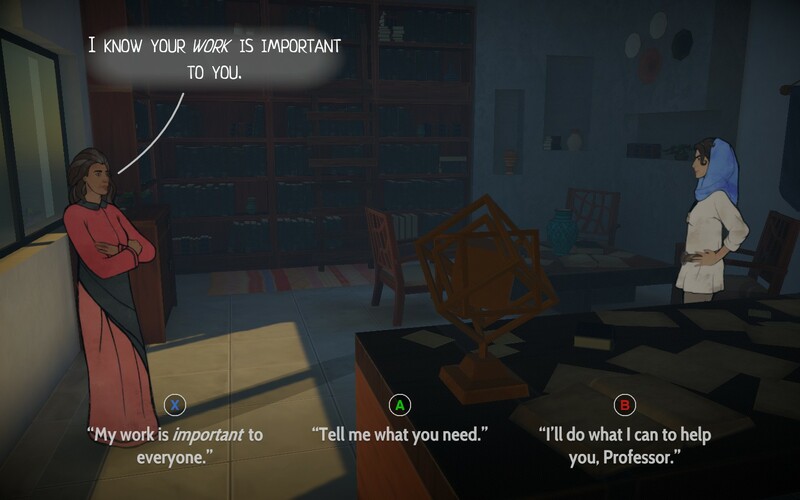 The science fiction-adventure Heaven's Vault, the new game from the developers behind 80 Days, feels like an answer to this ongoing experience. At its start, you're introduced as Aliya Elasra, an archaeologist from the University of Iox. She thinks she has history all figured out, but still has a fascination in exploring new places and digging up old things. Aliya is not like the others that live on the moon of Iox: she's bold, strong-willed, and has a distaste for things the other Ioxians take for granted, like their robot sidekicks. The history you start with in Heaven's Vault is Aliya's own. Near the start, we learn that she's not really from Iox: she grew up in the slums of the moon Elboreth, which is just a short sail away in the surrounding Nebula. She's sent on a task to track down a missing roboticist by the woman who plucked her from Elboreth as a teen, who she has a complicated relationship with. It's here where you begin to shape the story of Heaven's Vault, much like you do your steampunk-aestheticized path around the world in 80 Days. Only at first blush, it's only Aliya you're shaping. 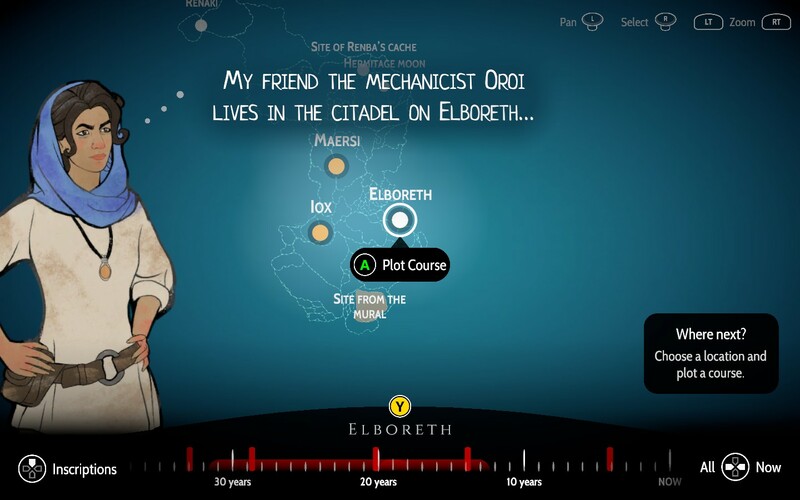 You do this through dialogue options, something the interactive fiction developer Inkle has become known for. Aliya can be sassy, but sympathetic to the downtrodden. She can be cruel and rude, to the point where it makes sense how she "lost" five robot aids assigned to be her in the past. Or she can be somewhere in-between. In my New Game Plus playthrough, I'm already seeing new conversations via different dialogue options, like when I pissed off Professor Myari, the woman who partially raised Aliya, so bad that she effectively stopped the conversation by kicking Aliya out of her office. The places I've gone so far in the beginning (before the game really opens up) are the same, but I feel like I'm getting a relatively new experience, which is refreshing. It soon turns daunting though, whether it's your first or third playthrough. With each new fact learned—whether from an artifact you discover, an etching of the Ancient language (merely called "Ancient") you find, or a conversation with an NPC—the vast timeline of the world grows, dating back anywhere from mere minutes to thousands of years ago. It's intimidating to sift through, and makes Aliya feel astoundingly small in the grand scope of this fascinating world we're traveling through with her. During the development of The Elder Scrolls 3: Morrowind, writer and designer Michael Kirkbride recalls being asked by a colleague, "If you're writing a history of the world, then which culture invented glass?" That minute attention to detail, of every facet of a world's making, courses through the rivers of air and water that stream through the Nebula in Heaven's Vault. I found myself fascinated by the smallest details. Like how this universe's alcohol, called "raqi," is made of fermented river water; or how one moon's people are afraid of sailing in the Nebula because they believe the rivers are powered by people's lost souls. I love how unique the three big towns you visit often feel, compared to the dry, empty remnants of past civilizations you rummage through elsewhere. As you quickly learn in Heaven's Vault, Aliya is at first only touching the surface of what lies beyond familiar moons that host diverse civilizations. And Aliya, being the archaeologist she is, is heavenbent on digging up a long-forgotten history. Aliya does this through deciphering the language Ancient. In the beginning, it's a massive task with no words really known to Aliya. She has to take in her surroundings to guess what phrases mean, lacking the knowledge she'll absorb over the course of the campaign. For instance, an inscription on a statue in the farm moon Maersi is an easy one to deduce. The statue is of a Goddess, and it seems she is there to bless the crops that grow aplenty. Translating the Ancient language is something of an ongoing puzzle to solve. A sentence or phrase is presented to you, and to solve what it means, you must consider what the object is (or what the inscriptions are on), your surroundings, and of course, the other words you've successfully translated that are similar in shape to it. Each time you make an educated guess on words in a phrase, you're typically rewarded with either the word being added to your dictionary, or a sad oopsie, crossing it off and knowing that that's not the correct translation. Throughout Heaven's Vault, your dictionary grows and grows with each new artifact you find and moon you explore. 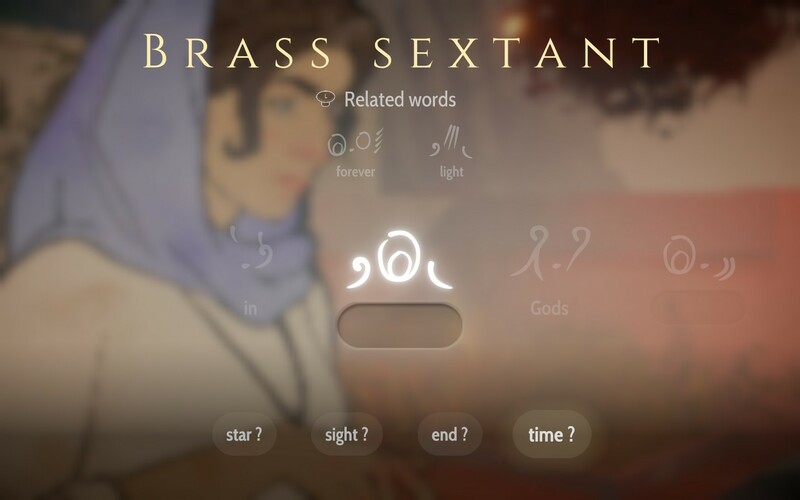 By the end of my first playthrough (which clocked in at about 17 hours), I was automatically recognizing glyphs for common words like "yourself" and "of," which makes me want to convince Inkle to make an actual language-learning game now. The downside is that the journey to these long lost fragments of history is led by tedium. Movement, in just walking slowly around moons and desolate rocks with forsaken ruins, is stilted. However, it feels like a deliberate choice due to how its painterly 2D character models fade with each step. It feels like how one might imagine stop motion animation feeling, in a peculiar way. For how elegant the writing and narrative branches are, the act of moving around its world is anything but. While sailing is soundtracked by beautiful music (something the rest of the game lacks, with a lot of awkward silence to the point where near the beginning, I wondered if I hit a glitch), it's cumbersome to turn and navigate your ship. Your map, before setting sail aboard the Nightingale, is usually glowing with a few points of interest of where to go to. 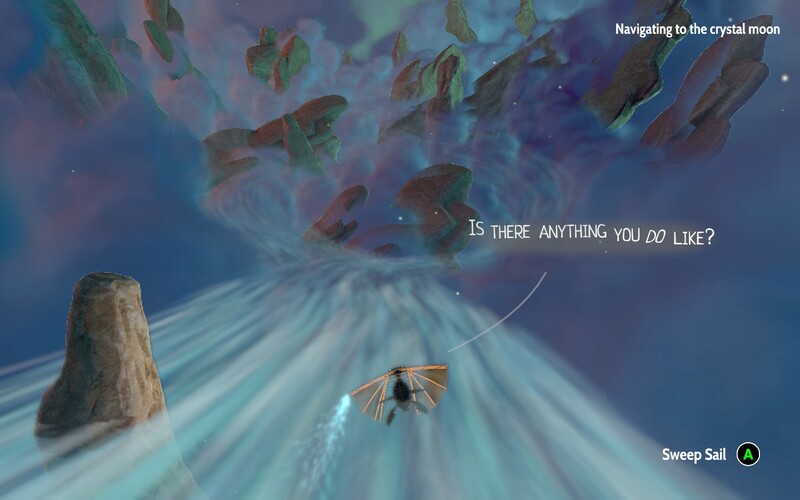 Once you choose one, you set sail towards it, whether it's to a mysterious hidden site you've already collected a few artifacts from across the Nebula or a moon with a town on it far away. Sailing is simple in control; your left and right bumpers turn your ship idly, while a sweep gives you a slight speed boost (there is no brake). Your robot Six calls out directions when you're sailing en route somewhere, which are sometimes wildly inaccurate. I would turn left like they instructed, only to get the pop-up telling me that I missed my turn. When I reset just before the fork, I'd take the opposite of the suggested direction and find myself on my merry way. Directional arrows are often hard to see in the cloudy rivers too, leading to a lot of missed turns. It's discovering hidden sites, where the rivers slow to glacial pace and you're left coasting slowly and trying to discover which big rock to land on, where the annoyance gets steep. Despite the slow flow of these rivers, turning around is impossible. On a number of occasions due to the finicky ship, I would miss a turn and be sent around a long loop to return to the same point, hoping this path would lead to my destination. With the more artifacts you discover, the narrower the search area is. Having more artifacts, I learned the hard way, is essential, because otherwise you might find yourself sailing in a circle for a half hour or more. Yet even with them, these segments are still slow and a bore. Sailing, in general, soured my time with Heaven's Vault—and you sail quite a bit. Conversations that would happen while heading somewhere would distract me from making correct turns, as the only voice acting is the occasional narrative voiceover of Aliya when entering a new locale. If I was in the midst of talking to my robot and came across an abandoned ruin on the side of the river, there was no way for me to cancel my conversation and see if it had any artifacts; in these circumstances, the end of my locked-in conversation would usually be bookended with "You missed a ruin," as if I hadn't hard turned into the side of the river to slow my pace, hoping for the conversation to end so I could approach the floating rock. Exploring hidden sites is where the paths of Heaven's Vault take new directions. You're presented with big decisions to make along the way too—like who you should trust, whether those that betray you deserve another chance, and so on—but it's also deciding what threads you want to pursue along the journey. Do you care about whatever the missing roboticist was investigating, or are you more concerned with digging up the history of the lost ship generations of the Nebula? Or perhaps you have other things on your mind? Heaven's Vault is guided by Aliya's ravenous curiosity, but also the personality she has along the journey. My first playthrough's ending was sadly underwhelming, because I stumbled into the end without realizing it. (And with autosaving and no multiple save files, I couldn't jump back to my point of no return.) I was a little bummed when I saw the credits roll, knowing of the story threads I accidentally left unresolved, of the library I never discovered but had a key for, of the characters I didn't get to say goodbye to or get to know better. Even with a New Game Plus just a few clicks away, wherein you carry over all your knowledge of Ancient, I felt sad that my time with this Aliya was through. My first Aliya was good friends with all her acquaintances on Elboreth, returning there often to get feedback on artifacts and learn more of Ancient as a result. She was compassionate, and even when characters turned their backs on her, she never did the same to them. She was noble and smart, and most importantly, always curious. By the end, I was a master at deciphering phrases in Ancient, and was even smarter with my educated guesses of the words I didn't know. And in my new playthrough, she's almost the opposite of all these things (except that last one), and the narrative is shifting accordingly. Heaven's Vault is not only impressive in the sheer scope of its histories, but in how meaningful its decisions feel. 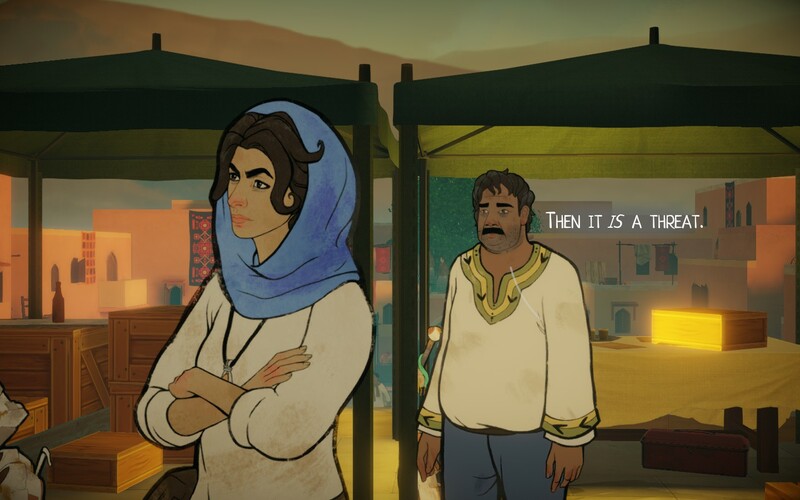 Heaven's Vault is a game about not taking the narrative of history spoonfed to us, but about challenging it and forging our own path. Even with any game-feel qualms I may have, it is undoubtedly successful in that right. 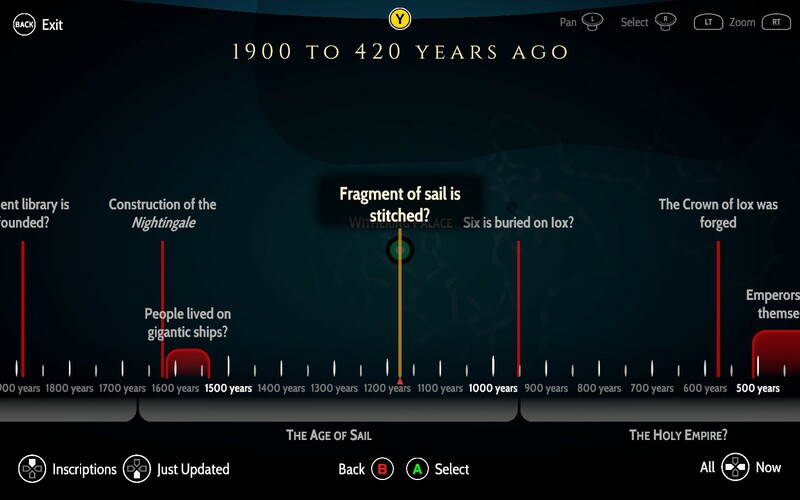 Tagged with Adventure,	Inkle,	PC,	PlayStation 4,	Puzzle,	Reviews.